Bariatric Girl » Blog Archive » Do you want to be perfect or happy? Stop toxic shame. Next Article« Beating Regain. Gina Getting to goal 9 years later. Do you want to be perfect or happy? Stop toxic shame. I saw this article by Brené Brown who is a research professor at the University of Houston Graduate College of Social Work. I feel like she lives in my head. This is the perfect example of how so many who have weight loss surgery believe that life will be perfect when….. I get that man….or that woman. And yes I’ve mentioned all this before but I’m going to say it again. All these things are the greener grass on the other side of the fence. If you are always looking to get to the other side of the fence you never get there! Even if you do get over the fence there will just be another fence and another…. You never….ever….get there. So what do you do? You start to look at the things in your life you are fortunate enough to have and you start being grateful. When you covet someone else’s “anything” there are just as many people wanting what you have. No matter what your life is like there are hundreds of thousands of people on this earth that would LOVE to be in your shoes. We are generally spending so much time wishing for things we don’t have that we never appreciate the things we’ve got. You may think that’s silly and no fun but I believe it’s equally silly and no fun to wish for something you don’t have. Many of my blog posts have said how we can ill afford guilt/blame/shame/judgment but I love how Ms. Brown points out that we believe perfection will alleviate the pain of those emotions. So if we understand perfection is not really possible and that means we cannot avoid the pain, what do we do to avoid it? We stop doing things that cause the dehumanization of others. We stop actions that make others feel “less than”. Forums and Facebook are full of people making others feel “less than”….they are full of people dealing out toxic shame. John Bradshaw wrote a book called “Healing the shame that binds you”. He discusses dehumanization or otheration (others making you feel less than). “Toxic shame is either inhuman or dehumanizing. The demand for a false self to cover and hide the authentic self necessitates a life dominated by doing and achievement. Everything depends on performance and achievement rather than on being. Being requires no measurement: it is its own justification. Being is grounded in an inner life that grows in richness. Toxic shame looks to the outside for happiness and validation, since the inside is flawed and defective. Toxic shame is spiritual bankruptcy”. Ask yourself the next time you type something or say something about others…are you contributing to someone’s toxic shame? I think you are enough too. 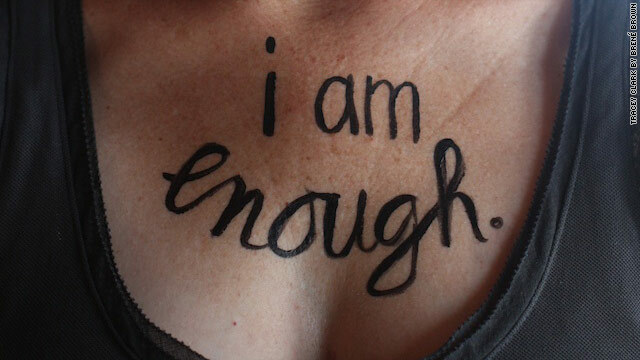 Stop toxic shame and we can just be….enough. Even just five years ago this was not talked about as popular opinion was that problems were fixed from the outside – fix the weight, fix the skin and life would be wonderful. People tearing down others as they have given up on themselves and loathe those who are happy and appear to have it together. So many people looking for validation from outside sources and confused when expectations are not met. In all reality we are all perfect exactly as we are at this very minute. That is the key! Love you Yvonne! Great topic for discussion. This is what I wrote about in WLS Lifestyles magazine – new issue that just came out. Thank you Susan. I’ll be looking for that issue! If we can just learn to “be” and grow in that experience. No one needs to tear me down because after suffering from obesity for so long I am still quite adept at beating myself up. I think I have gotten better but it is a process that I will deal with for life. Many of us are so hard on ourselves…. we need to find ways to lift each other up. Thank you for lifting me up. You cannot know how much it is appreciated. Love this and Love you! NOBODY could have said it better! That is the #1 thing I say when speaking at seminars, seek out support BUT make sure it is positive becasue there is alot of toxic thinking out here that can hurt rather then help. When we love and encourage others is when we can truly love and encourage ourselves. Emily I think we are quick to forget what it feels like to be right back to that obese girl that was always talked about. I assumed incorrectly that I would be loved and accepted with open arms in the WLS community. I didn’t realize that people are still people no matter what group you’re in but I just somehow thought that we would understand each other more…that we would learn to not fear each other because we are different from each other. I had dreams that mixing all kinds of people from all cultures would bring us together and break down walls. That has happened in some cases but prejudice of different sizes is alive and well. I just don’t understand why it’s OK with anyone to be mean. What are we teaching our children? And better yet I’ll bet that some of the people that are mean would never allow their children to be bullied the way they bully others. I cannot control it so I leave it and I encourage others to stand up against it and leave it too. It isn’t funny and it’s cruel. Every day is a new challenge and I don’t need complications or drama. I’d much rather try and help someone that is struggling instead of pushing their nose in the dirt. I’m a little raw right now I guess. I just attended the funeral of a friend of my husband’s. Addiction kills and mean people make life unpleasant. I’m searching out the light because I’ve seen a lot of darkness lately. And…Pink has a new single out that is very inspiring and about this very topic. There are two versions (explicit & clean). I recommend singing along with it often! It is called “F**kin” Perfect” Doing so has boosted my self-respect! yvonne, I know what you mean… the first time I saw people being mean to someone on the boards I was shocked. I felt the same way I use to feel when my children would fight, I hated it. I too thought that since we are all in the same boat so to speak that everyone would get along and if not except each others flaws at least tolerate them, but that is not the case, anymore then it is the case anywhere you have a group of people. What incredible insight! I like the part about that it reminds you of your children fighting. I don’t have kids but I get it….I just never thought about that and how painful that must be. I too thought we could at least tolerate our differences and learn from them. Fear is our biggest enemy because we fear what we do not understand. Thank you so much for your support. I have lived with people and extreme addiction for what seems forever. You’d think I would adjust a bit by now but every time I see a life lost, I mourn the person that ended up losing everything to their disease. There are so many in need and we should help each other instead of fight. Thank you Debra. I like the way you think. Yvonne, your post resonated with me in a little different way. It was more about how I talk to myself. I am just two weeks out from surgery. I was talking with my sister about the upcoming holidays. I said that I was more excited about the holidays than I’ve been in a few years. The last few years have been a little tough — I lost my mother, moved to another state for a job (that I love! ), and just have missed being close to the rest of my family. I also think I was more depressed about my weight than I realized. Throughout my life, my mother and I were always the hostesses for all our holiday gatherings. It has been my role for my whole life — my mom taught me to cook when I was 11, and she never liked cooking after that. So food was my contribution. So anyway, I’ve had to wean myself of that role over the last few years anyway with all the changes, but now with my surgery I can’t be the one who provides love through food anymore. SO anyway, I was talking about this to my sister and I said, without really thinking about it, “I just have to be enough.” And I paused, and burst into tears as my sister (who is absolutely the best!) 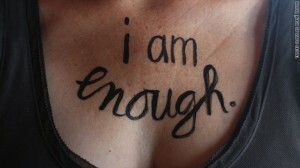 said, “OF COURSE your are enough!” It was just something I’d never really thought about before. Talk about a light bulb moment. I AM ENOUGH. Congratulations for making it to the other side! We can all be guilty of that stinkin’ thinkin’ and just because it’s been almost ten years doesn’t mean I don’t do it. I do “turn around” thoughts when I say something horrible to myself. If I say something bad to myself I replace it with at least five good things. When I was obese I was the queen of fat jokes and I could make fun of myself with the best of them. How sad that I did that. My friend Sheila always told me that I was always “just Yvonne” no matter what size I was. How wonderful that you have a sister that supports you! Please know that you ARE enough and you are perfect in every way just as you are. We can always fine tune ourselves and there’s nothing wrong with that but aren’t you smart to figure out that you can’t be the one that provides love through food. Things change and we grow. It sounds like you are well on your way to an excellent journey. This is a great article. I read your blog daily, and I am so inspired by you. I too have had weight loss surgery, just this past June, and I have lost about 80 lbs. I met you at the WLS Conference in Cincinatti. I feel like people are so different now that I have lost some weight, but why? Am I not the same person I was 6 months ago or was I someone else? Why do “we” as human beings, treat each other so differently, when a person is heavy or thin. People I am the same f***ing person I was 80 pounds ago, but now you seem to “like” me more since I am not the fat person I was then. I don’t see things the way other people do I guess. People have problems, and I mean not just fat people, but all the thin ones do also. They may just hide them better. I wish everyone could just get along and try to understand what life is about. I am so thankful for being able to get my surgery for my health issues. I had uncontrolled diabetes, which now I do not. Thank God. I went from taking 15 pills and 3 insulin shots a day, to taking nothing, (except vitamins, calcium and more protien than I knew existed). I am very thankful for everything I have in my life. I only wish I had better grass on my side of the fence!!!!! Thank you so very much for your kindness. It means so much to me. Congrats on losing 80 pounds!! I’m going to hopefully help you through this thought process because I felt the same way. I was a little angry about it too but…human nature is a funny thing and most people harbor some type of prejudice. It is unfortunate but I made the choice to not be mad anymore. Instead I focused on the blessings that came my way because I was obese. I had to be better at my job than everyone else. While others were out partying I was at home learning how to use a computer back in the early days. I sat at home and found out that I could make a lot of cool stuff and learn how to be a better photographer etc. etc. etc. Now that I am thin I can do a whole bunch of stuff that I would have never learned to do. We can’t control what other’s think about us but we CAN control what we think about what they did. That first year you will experience a lot of different emotions but I promise that it will settle down and smooth out. Don’t let the anger eat you up and work on concentrating on the great things (like losing 80 pounds) and letting go of the crappy people. They don’t deserve your time. Instead invest it with people that love and care about you. Leave the others to sit in their misery with their small minds, don’t let them rent space in your head because they don’t care. It was a hard lesson for me because I wanted to save everybody but not everybody wants to be saved you know? You’ll find as you go along that the grass will be green enough for sure. You no longer have diabetes and no shots or pills! WOO HOOOOO. I love hearing success stories like that because you inspire me! I hope you’ll stay close to me and let’s ride this first year out together. I promise it will all be completely different by this time next year. Balance and moderation will help you through it all. Thank you for sharing and thank you reminding me about meeting you in Cincy! Please feel free to express yourself or ask questions because I want to be there for you. Very good!! You always hit the nail on the head when writing for the WLS community. You are so right, people are people no matter where we meet them. I am 6 years out (this month:) and have maintained my weightloss this entire time, happily settled at 135, and at 5’7, I feel great. I recently attended a WLS support group for the first time and I couldn’t believe how I was treated–treated as if I didn’t belong because I was thin, I’d ben thin a long tine, and that having lost 150 lbs, I didn’t need any plastic surgery (I am grateful for a hearty stock gene pool.) Even within our own WLS community some of us are not welcome and we’re outcasted. Sometimes we just can’t win. I appreciate your mentioning John Bradshaw’s book. Even though it’s not a new publication it is timeless. When I was in graduate school, working on my MSW, I attended a conference where John Bradshaw was the keynote speaker and leading workshops. I sat through them all, absorbing all I could. His work served me well as I began my career as a social worker, working in domestic violence and trying to give clients a sense of self-worth. I didin’t seem to apply it to myself, as I should have, but I can see that it did apply to me too and I should have. “Thorney” (Mari) I just LOVE you. I have always loved your posts. We have so very much in common. We are the same height and 5 pounds difference. You also give me comfort in not being alone regarding your experience with the community. It means so much to me that you took time to post. I am so impressed that you attended John Bradshaw’s workshops!! One day I was browsing in the book store and I was drawn to the book. The more I scanned it the more I wanted it. How cool to find out it has been around for a while. I suspected it had been by the way it was written. Imagine that…you didn’t apply it to yourself. We sabotage ourselves in so many ways. I was always adept at helping others but not so much for myself. My mom was progressive way before her time and she talked so much about shame and guilt. She never judged anyone for anything and if I could be like her even a little I would be happy. Cancer took her in 2000 when I was my biggest and I begged God to take me instead because she was worthy and I did not feel I deserved to live. My life changed 6 months later after hearing about Carnie Wilson and I made my decision in 15 minutes to have surgery. (I was REALLY READY). Thank you again for your comments…I am honored to have you here. I am PERFECTLY HAPPY. Does that count? Love ya! The john bradshaw saying that always hits me is: I made a mistake; I’m not a mistake. I have to call on this mantra a lot. I have not yet had surgery. I meet with the surgeon on wednesday. Beverly have you heard anything? I don’t remember to check until I get back to the post and was reminded when I saw your reply. I’d love to know how your meeting went and if there’s anything I can do to help. Please let me know OK? Thank you Marika. I feel like toxic shame is one of the most damaging issues we deal with. I really appreciate your comment.